Exterior cladding options are numerous because many new materials and systems are being continuously introduced. Appropriate choices for exterior cladding materials should take into consideration the following issues. Exterior claddings should last the life of the building and be easy to maintain. Avoid exterior claddings with a poor performance record based on local experience. Also consider the time and cost associated with exterior claddings which require frequent maintenance. Materials may be renewable or non-renewable, new or recycled, recyclable or non-recyclable, and reusable or non-reusable. The use of non-recyclable and non-reusable materials is less desirable. Exterior claddings should be compatible with the building system being constructed. For example, in wet regions of the country where wind-driven rain commonly occurs, exterior claddings which do not serve as rain screens should be avoided. Exterior claddings should also be adaptable if numerous changes to the building are foreseeable over its useful life. Typically, siding, panel and stucco type claddings are more adaptable than masonry veneer types. In addition to these fundamental issues, the following points regarding the performance of entire wall systems may be considered. ^ Walls represent among the most expensive elements to retrofit in a building, especially when window replacement is included. When using exterior claddings such as masonry veneer, ensure that better practices in terms of thermal insulation levels and window quality are followed, otherwise future retrofit costs will often prove prohibitive. -» Exterior claddings seldom significantly improve the energy efficiency of a building. 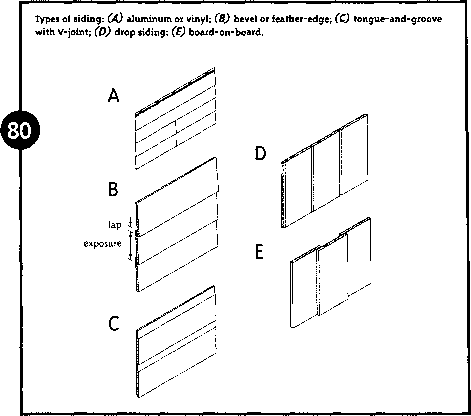 patterns, some of which simulate the appearance of wood bevel siding and vertical board and batten. They come in configurations designed for continuous interlocking between boards so that only the upper side of the board is nailed while the bottom edge is locked to the upper part of the board below (Fig. 8oA). Interior and exterior corners, termination points of the soffit and gable ends as well as windows and doors, are all treated with specially designed trim pieces. The installation follows the same simple steps that are generally applicable to any kind of siding of the small 6 to 8 in. (150 to 200 mm) width. Horizontal Application. 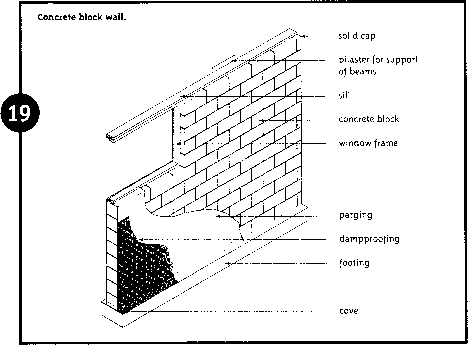 The wall is prepared by applying the sheathing membrane as described. In wet and humid coastal climates, furring on the wall is recommended to provide a "rain screen" and a vented space to facilitate drying. A level line is established around the house for the starter strip that is normally placed a minimum of 6 to 8 in. (150 to 200 mm) above finished grade. All trim pieces for corners, windows, doors and openings and starter strips are fastened. The siding is then applied in successive courses to the underside of the soffit. mm) apart and should all face in the same direction away from the general viewing angle. An important point that must be remembered in each step of the installation is the need to let the siding, especially vinyl siding, expand and contract with temperature changes. Always follow the manufacturer's installation instructions when installing siding. In the case of vinyl siding, the change in dimension could be from 1/4 to 1/2 in. (6 to 12 mm). If movement is restricted, buckling will occur. For this reason, the nails should be placed in the centre of the nail slot and not be hammered tight to the wall. Vertical Application. The same general rules apply to vertical application as to horizontal. Using the vertical method, the starting point is a corner of the building with the appropriate corner trim. All other trim pieces also precede the installation of the siding.